Elvenhome Farm and Cottage offer an eco-holiday experience, located close to the historic township of Deloraine. Hand built and cultivated for over twenty years, we are a Bio-Dynamic farm employing Permaculture design principles in both house and gardens. The farm showcases a diversity of environmentally sustainable living. Our unique self-contained cottage features bamboo floors and artisan crafted Blackwood windows. There are two bedrooms, comprising of a Queen bed suite and the second having comfortable twin bunks. The separate dining and living areas have a warm and spacious feel. A fully equipped kitchen is stocked with continental breakfast provisions and seasonal farm produce will be available for you to sample. A sun drenched patio is the perfect place to enjoy magnificent views and bird life. The farm is nestled into native bushland. The pre-existing clearing of five acres has been transformed into orchards, kitchen gardens, animal runs and structures for the home and visitor accommodation. A substantial orchard of fruits, nuts and berries, along with a vegetable garden, milking goats and laying hens provide plentiful supplies of produce year round. Within walking distance you will enjoy activities including swimming, fishing, bush walking and birdwatching. Farm Workshops in sustainable living are available daily. See website for details. Elvenhome Farm and cottage have been designed according to an understanding of the need for harmony in the landscape and for the health and wellbeing of all its inhabitants. By drawing on architectural knowledge of the golden ratio in building design, and using the wisdoms of a feng shui master,the shape of the cottage began to take form. The cottage design allows for the use of recyclable and renewable building materials resourced in a sustainable manner. Local craftsmen and artists have collaborated to bring the vision into reality. Passive solar design and orientation contribute to a minimal need for heating and cooling systems. Solar energy was used throughout the building process to power all trade tools. It continues to be the main power source for the entire property. Extensive water harvesting is made possible with large rainwater storage tanks and a spring fed dam to supply all water needs. Composting toilets further reduce water consumption. All waste water is filtered on site for irrigation of perennial tree crops. With this in mind, all soaps, shampoos and detergents are environmentally friendly, as they are distributed back into the farm system. Hot water needs are provided for by a combustion stove in the main house and an instant gas hot water system in the cottage. Evacuated tubes will be installed in the near future to further reduce energy use and ultimately the carbon footprint . All recyclable materials are separated and distributed to the local recycling centre. Signage is in place to educate guests about the need for appropriate methods of recycling. Permaculture principles are incorporated throughout Elvenhome Farm. Importance has been given to the placement and relative location of many elements supporting one another. Available biological resources are used according to the energy cycling principle. For example, fruit trees produce apples that feed our guests. The apple waste is fed to the chickens and the apple tree prunings are fed to the goats. Both the chickens and goats produce eggs and milk, to nourish our guests, and manure for garden and orchard, therefore the energy cycle continues and forms a closed loop system. Over twenty years of observing the patterns and cycles of nature within the farm allow for continual improvement in its sustainable permanent agriculture. Bio-Dynamic practices are used for the health and wellbeing of the animals, plants and humans on Elvenhome Farm. Each season, Bio-Dynamic preparations are applied to enhance the farm system. 'As above, so below,' is a simple understanding of the greater natural forces at play in our everyday lives. A farm walk that demonstrates the Bio-Dynamic and permaculture design features of Elvenhome farm. Seasonal selections, crop rotation, companion planting and other ways to get the best out of your kitchen garden. Learn the art, science and mystery of creating lush compost and enlisting worms to revitalise your garden soil. A Walking tour and explanation of the sustainable design features of Elvenhome Farm and cottage. This was a very different stay for us and we enjoyed every moment! It was informative, comfortable and we just adored the area around Deloraine! Would highly recommend to couples or families for a wonderful and ‘back to nature ‘ holiday. We stayed over for 3 nights and was surprised how new the place was. After chatting with Graham, we realised he just repainted the cottage in May. The cottage was really comfortable especially the wooden burner to keep us warm when watching TV. Lucky and Clover were very cute. Hope Clover will get some new friends to accompany her soon. Graham also brought us around his farm and introduce to us most of the plants. On a good cloudless night, you can admire the stars. It was spectacular. The only setback is that the location is hard to find. As long as you get the proper directions and a GPS, you will be fine. It is definitely worth a visit!!! Had a very relaxing one week stay with Graham, Clover the cow, Lucky the dog and the gaggle of chickens. Loved feeding the chickens each morning and collecting the fresh eggs. The cottage had an amazing kitchen and enough space for everyone. Just a tip though, Optus coverage was limited so a Telstra SIM might be useful to stay in contact if you need it. 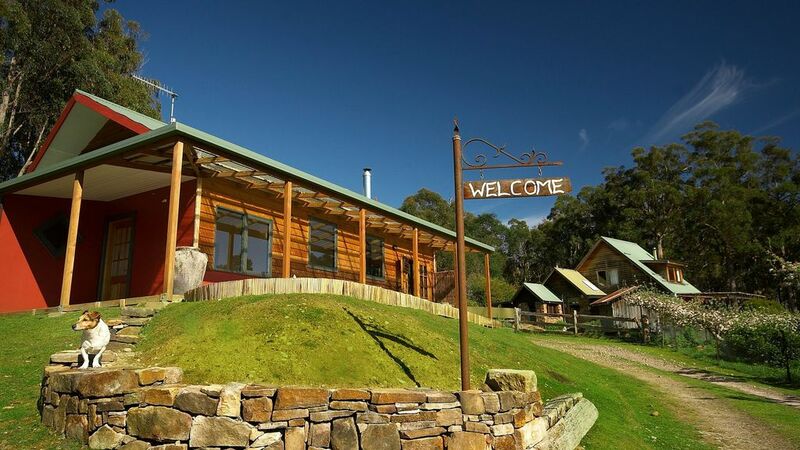 A perfect base to do day trips to Cradle Mountain, Launceston, Burnie etc and a beautiful part of the country. What a great place to enjoy nature! Host Graham was great in showing my family the farm and surrounds. We will remember the walk around the apple orchard, being with the cow, the goat and yes, not forgetting the tree house which my four children spent most of the time in. The sweetness of the green peas freshly harvested will never escape our minds. The walk up the hilltop to the neighbours' place was rewarded with the best 360 degree view with the sunset to seal the memory. Thank you for your wonderful place in Tazzie! We loved staying at Elvenhome Farm. It is beautifully furnished and designed and set amongst stunning landscape. The kids loved the chickens, Clover and Lucky! Graham was a wonderful host, we all had a beautiful relaxing holiday and we look forward to returning.